When I bought the car there was no rear bumper in place. I managed to get a nice set of re-chromed originals second hand. They have been stored for best part of two and half years on the wall in my garage. Costs will vary but the rough costs are including VAT and come in packs for the hardware. More like what’s in the packs to be precise. 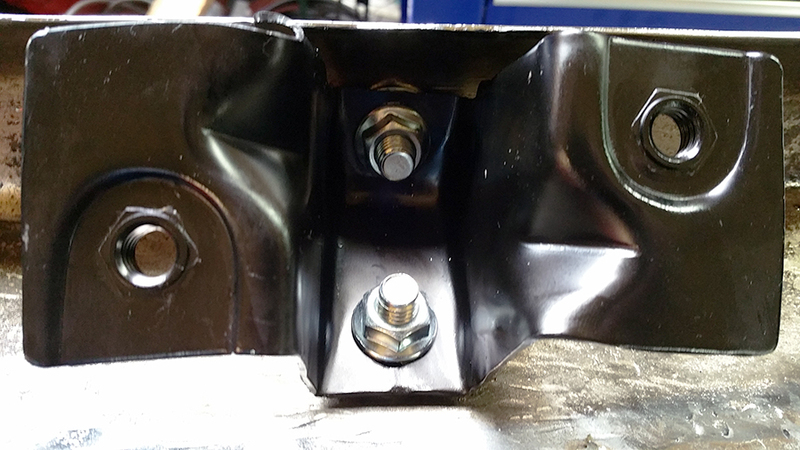 The deluxe bumper bolt kits will do the front and the rear bumpers with the nice shiny bolts and quality nuts. The wave washers are also supplied to fit between the bumpers and the braces or brackets as I have the bad habit of calling them. The rear mounting bolt kit has four bolts and deep dished washers that screw into the bracket and located to the body via the deep dish washers. The rear body brace pads come in a pack of four for the bracket bolts. The brackets come as a pair. The rear bumper is a choice matter, if yours is OK then no problem, but if you have to buy one then it quite an expensive item. Or you can get it re-chromed of course. The whole set up comprises of a set of deluxe chrome bumper bolts, bumper irons (which I never had), mounting bolts and set of mounting pads to go between the bracket and the rear light panel. The rear number plate fitting was screwed in first and only held in by two self tap screws. The wire will need to be long enough to get through the rear light panel to be connected to the rear side lights part of the loom. Next up was the bumper irons or brackets, these will only fit one way and are shaped to the bumper itself with the angles. 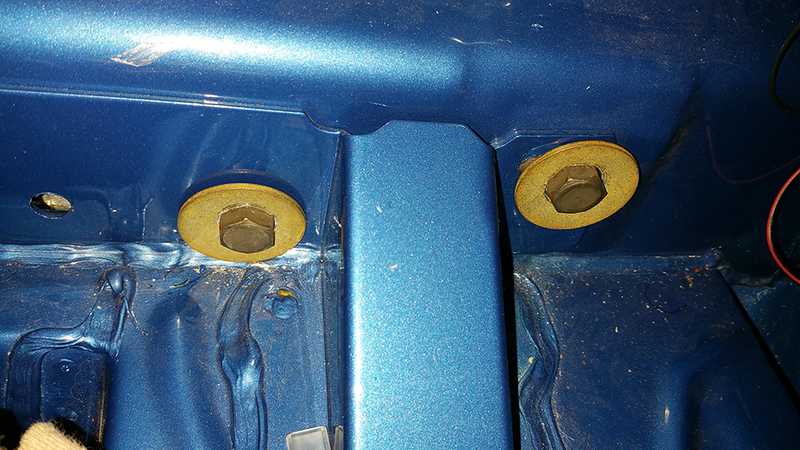 The bumper bolts are pushed through the squared out holes and the sprung washers are fitted over the bolts on the inside of the bumper. Again these will only fit one way up due to the collar on the chrome bolts. The bracket has to be massaged into place to fit the bumper and to try to get the bolts to sit flat. This a bit of an art that I didn’t have before. I loosened it all off again and readjusted the positions and cranked on some pressure, this was to collapse the bumper washers to the irons/bumper forming a good fit, and this also helps to also pull the bolts down into the bumper itself keeping them flat on the polished outside surface. 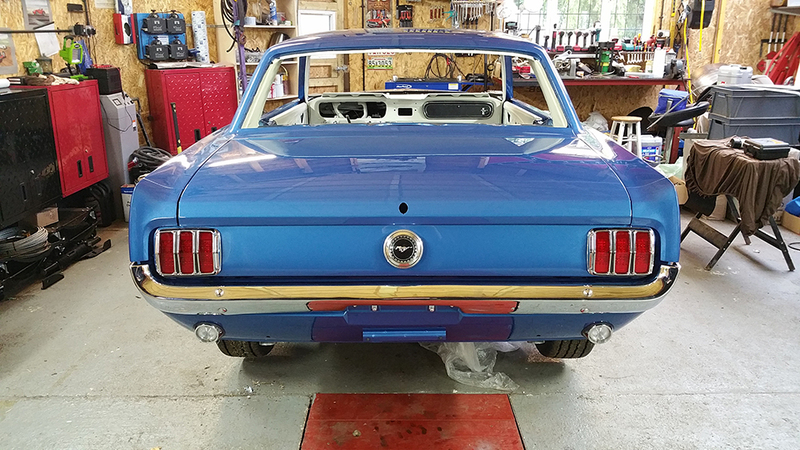 Both sides are exactly the same and there is no left or right hand sides on these parts until the later year Mustangs. The bracket mounting bolts are put through a large dished washer which is then pushed to the outside from inside the light panel, a mounting pad made of dense foam goes over the bolts on the outside. The pads are tight around the bolt and will hold the bolts in place to the light panel while you move the bumper around. The pads are there to insulate the bodywork and bumper brackets from being metal to metal contact and potentially damaging the paintwork. The two-man job to align the bumper to the bolts goes without question though, and the top bolts are tightened finger tight to hold the bumper in place for the initial line up to the panels. At this point an extra set of eyes sitting further back behind the car to advise, “up a bit, down a bit, over a bit, wooo – too much” etc. would help to save time. The bumper needed to move over a little bit as it wasn’t exactly central sitting under the rear quarter end caps. You can give it little nudge to adjust it over and move it before the final tension on the bolts is done up. From underneath the bumper you can see the bolts into the brackets. 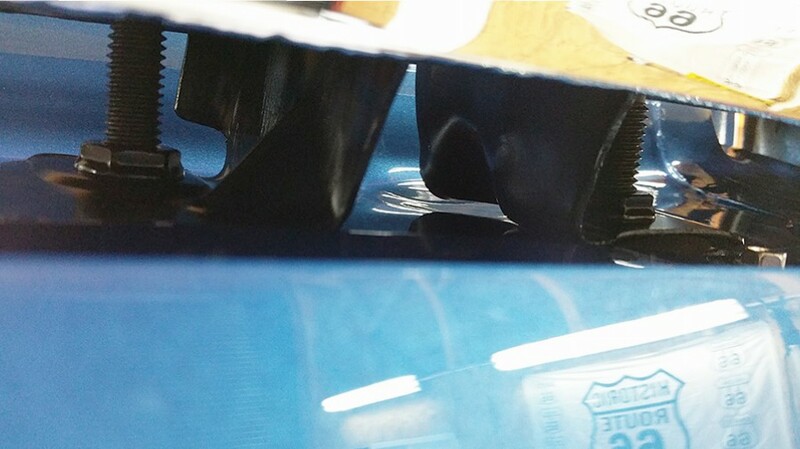 The two bolts each side of the bracket are allowed to move inside the slots for some movement to align them up. This aligning up of the bumper takes time and is worth doing well to keep the back of the car looking symmetrical. Tightening the top and bottom bracket bolts will move the bumper up and down and may need to be adjusted a number of times before you are happy with the fit and look. The down side of this walkthrough is that photo’s couldn’t really be taken as we were holding the bumper. The end result was brilliant, a fantastic fitting bumper, as good as I have seen anywhere. Well chuffed with it. A good fitting bumper will make a huge difference to the look of the car, I have seen some with the gaps all over the place and it just makes the car look as though it hasn’t been looked after. This is without question a two man job to do it properly mounting the bumper or you risk damaging your bodywork. The brackets and bumper fitting can be an issue. They may need to be cut and re-welded to get the angles right to make the bolts fit properly. As it was the bumper bolts that went into my brackets were at a slight angle, wrenching them in tight managed to pull the bracket and the bumper together to make the head of the bolts lay flat. I was lucky, I reckon another couple of millimetres and it wouldn’t have pulled in correctly. The wave washers obviously help to take up the gap and hold it together by spreading the clamping pressure about. The fact that it takes two to fit it initially makes it tricky, adjusting the bolts and the alignment of the bumper to the bodywork is time consuming.